One bedroom apartment of 38 m2 on 1st floor of large apartment building at the top of 1650, accessed by lift and stairs. Comfortably sleeps 4-5 people. Excellent location, right on the piste, the Petit Moriond gondola being a very short, easy downhill ski from the building, and you can ski straight to the back door. 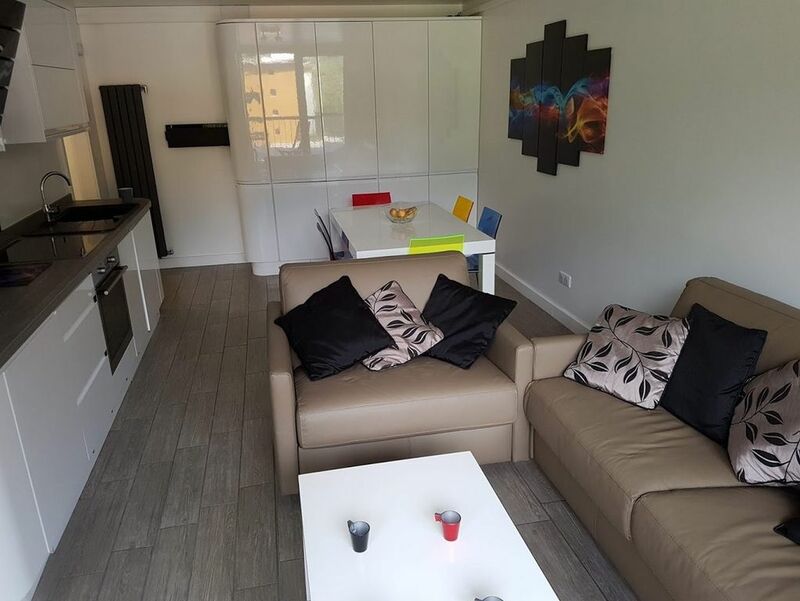 The apartment was modernised in 2016 and is fully equipped for a self catering holiday, with high quality kitchen units and brand new appliances (oven, induction hob, microwave, dishwasher & fridge), and the electric sockets have a mixture of English and French fittings, plus USB charging points. The double bedroom has plenty of storage space in fitted units, and has great views of the mountain, looking up to the Saulire range. There are two sofa beds in the studio living area; one double and one single. Underfloor heating throughout. Large ski locker, (can also hold bikes for Summer holidays). Southerly facing balcony enjoys uninterrupted views up the mountain. Free car parking immediately outside the building, with overflow car park opposite. Courchevel-1650.com is run by John & Julie Moore, who live in S.E. England, and are both music lovers, playing violin at Maidstone Symphony Orchestra. We bought our first apartment in Courchevel in 2001 and love visiting the resort, never tiring of the fantastic skiing facilities offered in the Three Valleys. We had skied in Courchevel before, and loved the vast skiing area, but knew that, to ski every piste in the Three Valleys would mean returning for several years! 1650 is a family orientated resort with charming character, and appealed to us with its interesting variety of shops and restaurants. The Ariondaz apartment buildings offer genuine ski-in/ski-out facilities, and with plenty of free car parking, a games room with table tennis & table football, there's something for everyone here. We ski several times each year, and have never tired of skiing in this fantastic resort. Genuine ski-in/ski-out. The views from our balcony are simply stunning, looking up towards the Saulire mountain peaks at 1850. As the apartment is south facing, we get the sun most of the day, and there's nothing better than returning home after a day's skiing to relax on the balcony with a drink! During the summer months, there are some great walks through the woods from just opposite our apartment, and one awakes to the sound of bells from the local Beaufort cows, as they graze on the luscious green mountain pastures. You can ski directly from the back door to the Petit Moriond gondola. Courchevel 1650 has some gentle nursery slopes near the gondola, with one free drag lift, so beginners don't need to buy a lift pass to use the Mickey green run. There is a wide range of skiing to suit everyone from beginners to intermediate and advanced skiers, and Courchevel has a reputation for having some of the best groomed pistes in Europe. 1650 links easily to the other resorts including 1850, 1550, Le Praz and La Tania, and with over 60 lifts, there are rarely any queues. Courchevel is part of the Three Valleys Area, with access to 600km of downhill skiing. With pistes above 2,500 metres, skiing and snowboarding is assured throughout the season, with over 600 Snow Cannons. There is a floodlit slope (open until 7pm nightly) above Courchevel 1650. 1 double bedroom apartment 38m2 comfortably sleeps 4-6 people. Two sofa beds in living area. All beds are comfortable and have their own duvets and pillows. Separate toilet, next to bathroom, which has a bath, shower and handbasin. Underfloor heating, central heating, permanent supply of hot water—no waiting around for baths or showers! South facing balcony means we get the sun all day, view from the apartment is stunning. Cleaning / Towels / Linen Towels and bed linen NOT provided. Three double quilts and 8 pillows. The apartment is cleaned before guests arrive (included in price). Other: Large ski locker room has plenty of space for ski/snowboard equipment, will also hold several mountain bikes. appartement fonctionnel et très bien situé. C'est la 2ème fois que nous séjournons dans cet appartement et nous sommes toujours aussi ravi ! Il est excellemment situé au sein de la station, l'appartement est très bien équipé et est idéal pour un séjour en famille. Nous le recommandons vivement. Nous conseillons vivement cet appartement. Nous le relouons déjà pour l’année prochaine. Thank you Stéphane, we're delighted you enjoyed staying in our apartment again last week. And already looking forward to welcoming you again next year! We really enjoyed our stay at this apartment. The building is ski-in & out, and its facilities are first rate. As for the apartment itself, it's in a great position to take advantage of the alpine sun; it's a good size, clean & modern, and the beds are very comfortable. Highly recommended! Thanks Karl, we're pleased you enjoyed staying in our apartment and liked the new sofa beds. Glad you had a great holiday! Great stay at John & Julie’s. The apartment is modern, clean and functional. The beds were particularly comfortable and there was plenty of heat and hot water - everything you need for comfort after skiing. It’s well located for the slopes and restaurants. Overall highly recommended. Really pleased you enjoyed our apartment Lorna, and glad you liked the beds. We're very pleased with the new sofa beds which combine great comfort as sofas with an extremely comfortable night's sleep. We really enjoyed our week in Courchevel, particularly being able to ski in /ski out. The apartment was clean and had everything we needed. The information provided by the owners, John and Julie Moore was very useful and informative. Spacious, comfortable and modern apartment situation close both to the bars, shops and restaurants, as well as the ski slopes. The apartment is well-kept, with colourful décor, making it cozy. The apartment also boasts an excellent balcony with wonderful views over the mountains. This apartment also has the added bonus of good parking. There are five airports within 2 1/2 hours drive, so ski weekends, snowboard breaks and short ski holidays to Courchevel are perfectly feasible. Chambery Airport is just one and a quarter hours drive away, in good driving conditions, so you can be on the piste quickly. Eurostar operates weekend services from London and Ashford to Moutiers, 25 minutes drive from Courchevel. Take a taxi or a bus to the resort. Also consider 'Ski Meribel', a luxury 'sleeper coach' with fully reclining seats. Free ski buses (navettes) operate regularly every day between the different Courchevel resorts, making it easy to get around, for example if you want to eat out at a different resort. We have negotiated discounted prices with one of the local ski shops, who offer discounts up to 65% off all ski & snowboard equipment hire for online bookings. Booking Notes: Please contact the owner to confirm arrangements. A 30% deposit is required to secure a reservation, the balance payable 4 weeks before your holiday. We don't require additional deposits. The price includes electricity, hot water, cleaning, and all tourist taxes. If you wish to book any other time outside the main Winter and Summer seasons, please contact us to discuss your requirements, and we will be pleased to confirm the price. Changeover Day: Saturday changeover. We ask guests to leave by 10am and to try not to arrive before 4pm if possible, to allow time for the apartment to be cleaned. However, we can often be flexible, and will do our best to accommodate specific requirements. Notes on prices: The cost of hiring our apartments in the Summer is £350 per week (July & August). If you wish to book any other time outside the main Winter and Summer seasons, please contact us to discuss your requirements, and we will be pleased to confirm the price. The price includes electricity, hot water and all tourist taxes.